Certain job-site locations are particularly prone to the hazards of combustion. Industries such as petrochemical, gas, and some types of manufacturing, typically have exposure to these risks. When using any type of electrical equipment (including two-way radios and radio accessories) precautions should be taken when working in an environment with combustible materials in the atmosphere. One precaution is to ensure all electrical equipment meets intrinsically safe standards for the type of environment it will be operated in. This write-up does not serve as a source to determine how a location should be classified, it's purpose is for general information and to help our customers understand equipment classification markings of intrinsically safe radios. Click here to see a list of Intrinsically Safe Radios we offer. Intrinsically safe equipment is engineered to provide explosive protection to the electrical circuits of a device. Equipment designated by the manufacturer as intrinsically safe is designed so it will not release sufficient electrical or thermal energy to cause ignition of combustible elements present in the atmosphere. There are different intrinsically safe classifications based on the type of hazardous material present where the equipment will be operated. Equipment certified as Intrinsically Safe must be distinctively marked in accordance with the classified area in which it can be used. The minimum marking must indicate Class, Division, Group, Maximum safe operating temperature or temperature range, and any special conditions that must be observed. Remember, both the radio and it's accessories (battery, headset, etc.) must be IS-Approved. For information about the rating on a specific radio, it is best to check with the manufacturer. The rating information is usually indicated on the product brochure or spec sheet for each radio (found on most manufacturer's websites). We can help get you the correct information if you need more detail. Only use Intrinsically Safe Approved (IS) radios and accessories in hazardous locations. Never charge the battery while in hazardous areas. Do not install or remove the battery in hazardous areas. Do not install or remove accessories (such as speaker mics or headsets) in hazardous locations. Never use a radio or accessory that is damaged. Ensure there is no damage to the radio and accessories (such as an antenna with a damaged end, or a speaker mic with a damaged cord). 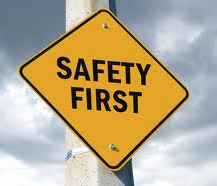 Installation of an IS rated battery into a non-IS rated radio will NOT convert the radio to intrinsically safe. In North America, a variety of standards and regulatory agencies oversee safety issues of hazardous locations. Regulations defining hazardous locations by means of a Class and Division system have been formulated by the National Electrical Code (NEC); Canadian Electrical Code (CEC) and the National Fire Protection Association (NFPA). Compliance to these regulations is required by equipment manufacturers who wish to designate their equipment as 'Intrinsically Safe'. These standards enable manufacturers to design explosion-protected electrical equipment. This equipment is then tested at agencies such as SGS, Underwriters Laboratory (UL) and Factory Mutual (FM) for compliance. On successful completion of the tests, these agencies issue certificates certifying that the required safety standards for explosion-protected standards have been met. The classification system most widely used in North America is defined by NEC, CEC and NFPA Publication 70. They define the type of hazardous substance that is or may be, present in the air in quantities sufficient to produce explosions or ignitable mixtures. Actually determining the classification of a specific location requires a thorough understanding of the particular site. For more information on classification please go to the appropriate regulatory agency. Class – The type of explosive or ignitable substances present in the atmosphere. Group – Materials grouped based on their ignition temperatures and explosion pressures. Division – Evaluation of location, independent of the Class. Temperature – Maximum operating temperatures on the surface of the equipment which should not exceed the ignition temperatures of the surrounding atmosphere. C. Ethylene, Ethyl Ether, etc. Ignitable Fibers & Flyings No specified groups. Types of materials: rayon, cotton, hemp, cocoa fiber, jute, istle, oakum, Spanish moss, etc. The temperature class specified for the equipment shall not exceed the ignition temperature of the specific gas or vapor to be encountered. Ignition temperature is the minimum temperature required, at normal atmospheric pressure in the absence of a spark or flame, to set afire or cause self-sustained combustion independently of the heating or heated element.